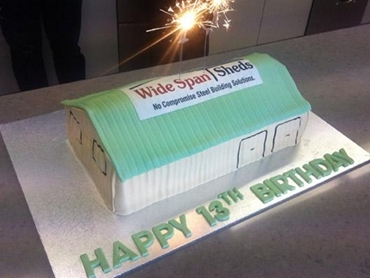 Wide Span Sheds is celebrating its 13th anniversary by launching a range of Customer Peace of Mind guarantees for their steel sheds and kit homes. Beginning as a small business operating out of a small office in Sanctuary Cove on the Gold Coast, the brand is now leading the Australian steel shed and kit homes market. The Wide Span Sheds product range includes steel sheds, farm sheds, garages, workshops, stables, riding arenas, barns, home and industrial buildings that are sold in kit form. Sold Australia-wide by a national sales team, Wide Span’s products are also distributed through a network of agents in rural towns throughout the country. Wide Span Sheds sets the bar high when it comes to engineering quality, manufacturing their kit buildings from BlueScope Steel, only the strongest steel on the Australian market. Over a decade of experience has allowed the brand to continually tweak and improve their steel building designs to suit the Australian market and harsh weather conditions. For greater safety, Wide Span Sheds has added structural integrity through extended purlins, girts and overlaps as a standard feature. Sheds and kit homes are designed site specific, taking into consideration design criteria such as wind region, shielding and topography, and whether any snow or earthquake loading is required. Committed to providing the best products to their customers, Wide Span Sheds has introduced a range of Customer Peace of Mind guarantees including the ShedSafe Accreditation, Steel Guarantee, and Supply Guarantee, ensuring the steel building kits will be delivered complete and undamaged. The guarantees were launched in response to many customers having less than ideal experiences with other players in the shed industry. General Manager – Sales and Marketing, James Folwell believes their customers have the right to deal with professional and friendly staff and be certain that they will actually receive their shed when they have paid for it.